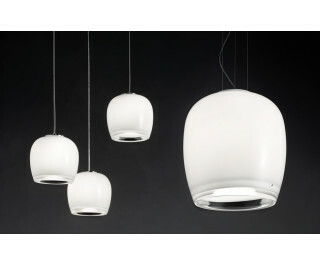 The Implode SP Pendant Light by Vistosi has been designed by Gregorio Spini. The Implode SP suspension lamp is part of the new collection of lights that are using the implosion of a volume to create an illusion of a surface. The thick glass shows a gradation of layers of white and transparent crystal. The fixture has a color tone of glossy white with all metal parts in white. This classic, elegant design will illuminate any decor.